How do you stop people from abandoning their shopping carts and increase the conversion rate of your checkout process? To get more people to go through the checkout process and complete a purchase, you want to give them everything they need to make a well-informed and confident choice about buying your products. On top of informing prospects, you want to make your checkout process is as smooth and hassle-free as possible. Keep reading to learn how to turn more of your visitors into customers by improving conversion rates on your checkout process. 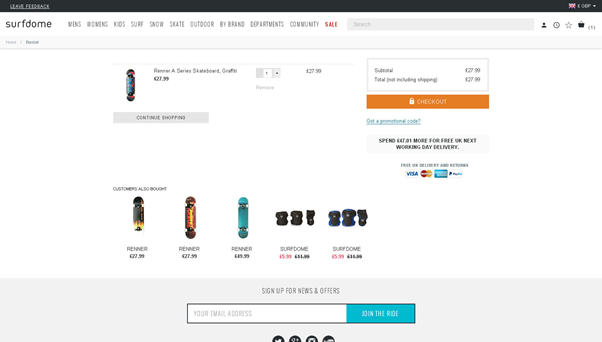 When a customer adds an item to the shopping cart, there should be a small animation with a product image and/or confirmation text on the top right-hand corner of the product page. The human eye reacts to movement, so this visual cue indicates an important purchase progression for visitors. The images of the products in the cart should be in thumbnail format so they don’t take up too much space on the page, and including an image lets the customer know exactly what it is they added to their cart. The product thumbnail is identical to the image on the product page, reassuring the customer that they put the right item into the cart. The product page should display images of an item in high resolution so that customers know exactly what the product looks like before they buy it, and their expectations are managed. You don’t want a customer to return an item simply because it didn’t look as it appeared on the product page. 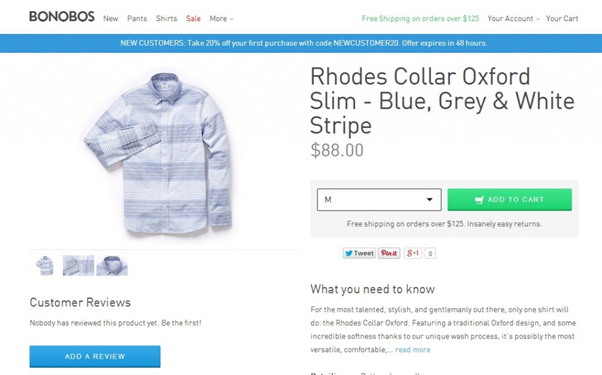 Bonobos’ product page below shows a large image of the product in high resolution. There are even a couple of close-up versions of the shirt, which can be enlarged. This way, customers are able to clearly see the material the item’s made out of, as well as the buttons, collar, and striped design. 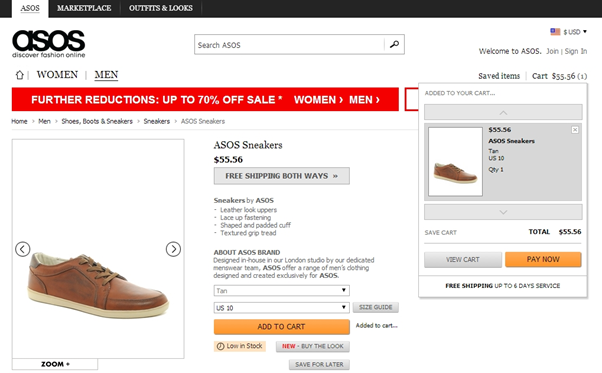 ASOS also provide a clear image of its products on the product page. You can see below that the shoe is a high-quality image, and it helps the customer determine whether it is the right style for them. You can even zoom in to see a larger version of the item and click on the arrows to view the shoe at different angles. A cart summary should list down the contents of a customer’s basket; the name and number of items, the price for each item and any additional information that is necessary (size, color, etc.). It should also include the shipping & handling fee, GST, insurance fee, gift wrapping charge (if applicable) and total cost of the order. In fact, 59% of customers expect to see the total cost before they proceed to checkout. You need to let your customers see the total amount of money they will pay for their order from the start so they don’t get unpleasantly surprised by the costs at the end, which could result in cart abandonment. The more transparent you are, the higher the level of customer trust and the more likely they will buy from you. 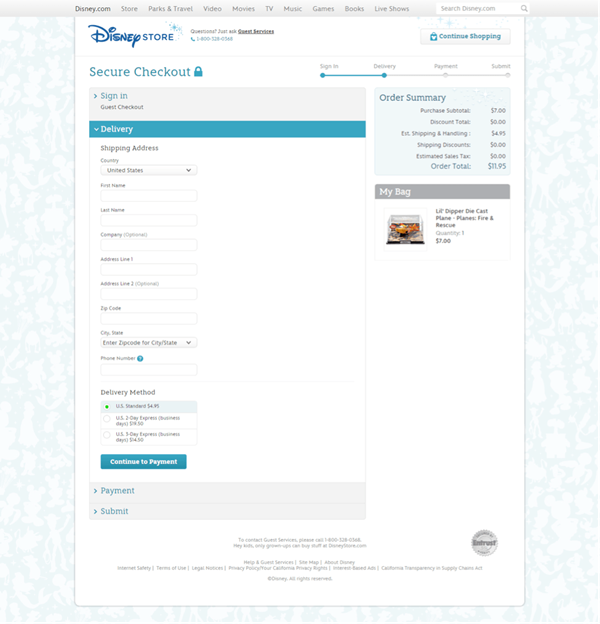 The Disney Store cart summary, as shown below, includes details of the product and all the costs the customer has to pay; such as the price of the item, shipping and sales tax. Your customers should be able to delete an item in the shopping cart, increase or decrease the quantity, and edit the size or color of an item all from the same page. 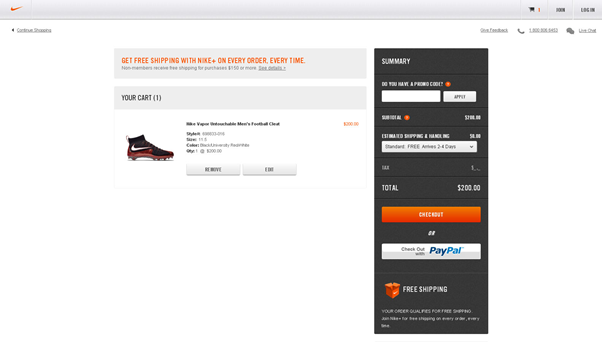 As you can see here, the Nike Store lets the customer do exactly this in their cart. They can edit the size, colour and quantity of the product, as well as remove the product if they change their mind and no longer want to buy it. 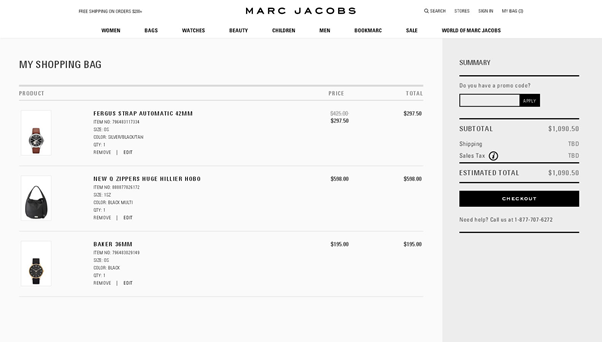 Customers also have the ability to edit the products in their shopping cart on Marc Jacobs. They can remove an item, change the quantity, and choose the color they want. If a customer can’t edit their shopping cart from the checkout page and have to keep going back to the product page to make changes, they might just give up and not complete the checkout process. So make sure to include this option. Another important thing you should let your customers do during the checkout process is to be able to save products to their cart or add items to a wishlist for purchase at a later date. If a customer is unable to do this, they could lose track of the items they want to buy from your site and end up not completing the checkout process. It also increases the chance of a customer coming back to buy later, rather than just forgetting about your site altogether. Product ratings and reviews are one of the best forms of proof you can provide customers during the checkout process. 70% of consumers read product reviews before they make a purchase and they’re 12x more trusted than product descriptions provided by the manufacturer. Customers rely on the experiences of others to help them gauge the quality and value of a product before purchasing. Reviews quickly establish trust for your business and the product you are selling, so the buyer has peace of mind and is ready to take the next step. But not just any review will do. Consumers have been exposed to online product reviews for a long time now, and they are subsequently savvy enough to spot an inauthentic one. The best product reviews not only include an average star rating, but also show the total number of customer ratings overall to show people that the sample size is reliable. Make them authentic – If all you have is 5-star reviews, people won’t believe you. Encourage authentic, genuine and regular reviews from your customers. Always show the average rating AND the number of ratings – By showing the number of ratings for a product it helps people believe that the overall rating is credible and reliable. Use third party review sites – If possible use third party online review sites to track and rate your products. Once people see that the rating has come from an independent third party, they are more likely to believe that it isn’t just made up by your marketing department. Here are some online review site examples for you to try out. 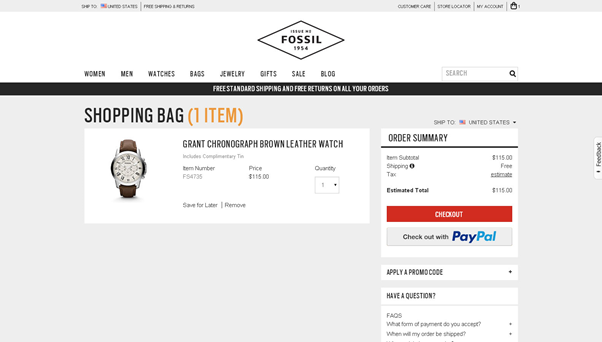 There are several other types of social proof you can use to increase conversions during the checkout process, as well as product reviews. Expert social proof is when a product is endorsed by an industry influencer, for example, in a Twitter mention, a blog post or a press quote. Celebrity social proof is when a product is recommended by a famous person who’s properly matched to the brand. User social proof is when your product gets a stamp of approval from current users, which include online reviews, customer testimonials and case studies. Wisdom of the crowds social proof is a product recommendation from large groups of other people who’ve made a purchase from your company. Wisdom of your friends social proof is when you offer rewards to customers if they refer their friends to your site and those friends buy a product from you. Crate & Barrel, for example, ask customers to write reviews on the products they buy from the company, as well as give a rating out of five stars and share photos of the product. The product images are helpful and can convince others to buy the products. Make sure to include the shipping methods and costs on the checkout page. For example, “Standard Delivery” which takes 2-3 days to get to the customer’s address and is the cheapest option, “Express Post” for next business day delivery and is a bit more expensive, or a trackable option that costs a lot more. The number one reason people abandon their shopping carts is high shipping prices that weren’t articulated previously. Make it crystal clear to the user at every step of the process how much it is going to cost so there are no surprises. If you can offer free shipping it increases the chance that your prospects will buy from you. If not, you could provide free shipping when a customer spends more than a certain amount. This will make customers add more items to their cart and come back to buy again. Also, try to include an approximate shipping date and the date the customer can expect to receive their order. Then explain what they can do after they’ve made their purchase, such as checking their account for order updates, or to track their order if they chose a trackable shipping method. 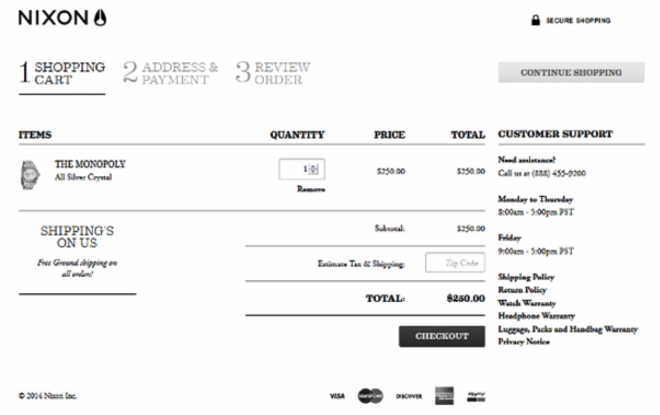 Every single field you add to your checkout forms decreases your conversions. Make sure it’s quick and easy for people to fill out your checkout forms by asking for only basic personal information, such as their name, email, address, phone number and password. Also include explanations on how the information will be used, e.g. Email address (so we can send you a receipt). 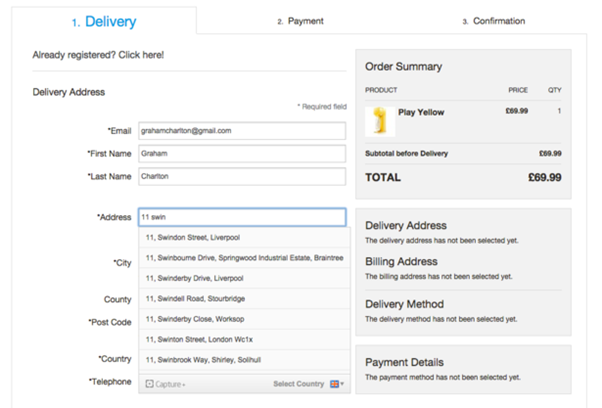 Use autofill forms so your customers don’t have to type, for example, their street address and postcode in full, saving them a lot of time. You can also enable dropdown menus for “Title” (Mr, Mrs or Miss), “State” or “Country” so a customer can just select the relevant answer from the list. In most cases, a customer’s billing and shipping addresses are the same, so provide a tick-box. This way, the customer doesn’t have to complete two forms. Remember, you want to make the process as efficient as possible for the user. An added bonus is to save a customer’s information on the forms so they don’t have to fill in the fields again the next time they make a purchase. 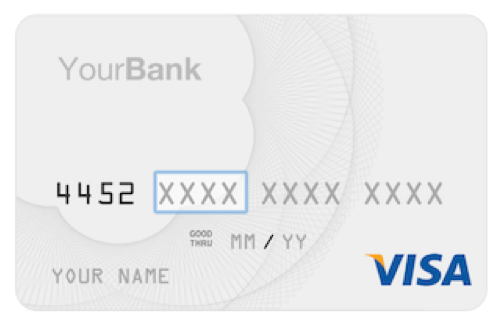 When it comes to your credit card form, consider making it look like an actual credit card, as shown below, so the customer can just type in exactly what’s on their card. You can do this with Skeuocard or Try Chec. Inline form validation is when you indicate when a user has not filled in a field correctly or if a user has missed a field completely. Inline form validation can decrease errors by up to 22% and almost halves the total amount of time it takes for someone to finish a form. 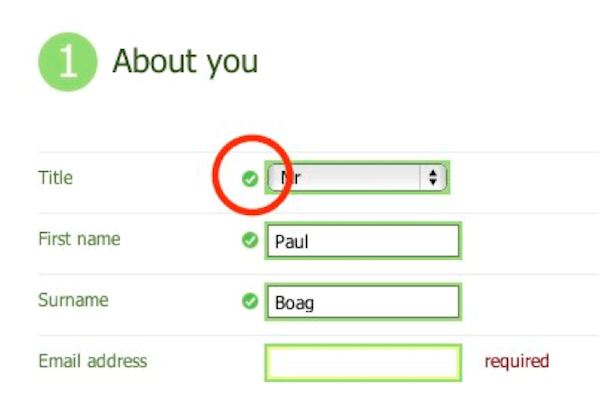 As you can see in the example below, a green tick beside the field indicates that the customer has filled it in correctly. The email address field is highlighted with an inner yellow border and has the word “required” written beside it to let the customer know that it’s the next field they need to fill in and that they can’t skip out on filling it in. Have clear error messages, like mini pop-ups on the page or crosses, words or speech bubbles next to a field, indicating when someone hasn’t filled in the field correctly or if they’ve completely missed a field. If you are using multiple pages for the checkout process rather than a standalone page, then you should have a progress bar at the top of each checkout page or some other visual indicator. This way, a customer will know where they are in the process and what else they have to do to finish the purchase. To stand out from your competition, create a checkout process that only has four or five steps. The fewer clicks there are in the checkout process, the higher your conversion rate will be. 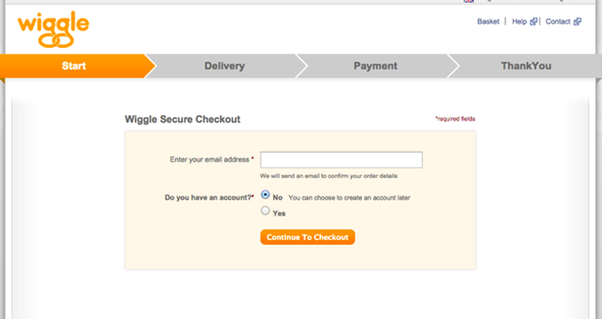 Wiggle’s checkout page, shown here, has four steps to the checkout process: start, delivery, payment and thank you. While “Thank you” isn’t commonly used for the last step in the process, it’s unique and different and can make a customer feel positive about purchasing from your site. Although it may be a good idea to encourage people to register an account with your business before they make a purchase, you could actually end up losing potential sales. More than 25% of people abandon their shopping cart if they’re forced to create an account and register with the site. Plus, a “Continue to checkout” button can bring you 45% more sales than a “Register an account” button. To prevent cart abandonment, provide guest checkouts. Let your customers choose whether they want to create an account or proceed as a guest. For guest checkouts, use the words “New customer”, “Guest checkout” or “Checkout as a guest” instead of “Register”. For the email registration step in your checkout process, change the text on the button to remove a sense of doing work, and explain why it’s beneficial for the customer to register and that registration is optional. Also, make the experience faster and better for your customers by using fewer words. 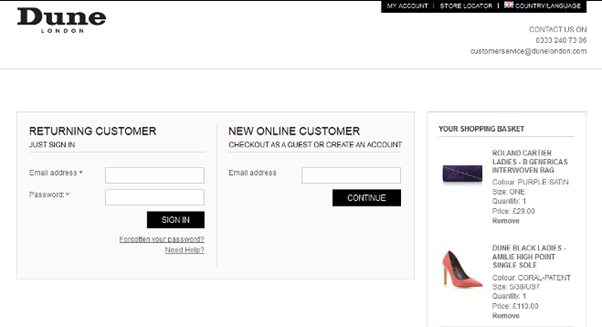 You can let your customers create an account after checkout on the “Thank you” page with just 1-2 clicks. Simply ask for their permission to create an account and for their password (or auto-generate it for them). This is a good option because the customer doesn’t have to fill in their name, email and address, as it’s already recorded in the system. People will be more than happy to give you their contact information for the purpose of tracking their order after they’ve made their purchase, instead of having to stop to fill in their details at the start. 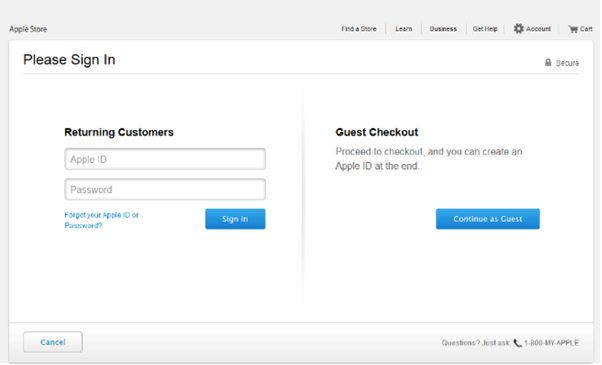 Apple’s checkout page includes a guest checkout and tells customers that they can create an account at the end of their purchase. Including a “Back to Shopping” link on the checkout page enables customers to fill their shopping cart with more products. Being able to continue shopping from the checkout page is a great option in the event that a customer forgets to add something to their cart. It’s also good to add this link because in some cases hitting the back button can result in items disappearing from the cart, which you can imagine will only frustrate your customers and they may end up leaving your site. To prevent this from happening, give them the option to continue shopping for more products to add to their cart from the checkout page. Before placing their order, customers may have specific questions about a particular item that’s not answered on your site and they want an answer immediately. Having a live chat option on the checkout page is ideal for this. On the eBags checkout page below, a live chat option is available so customers can get answers to their questions in real time. The live chat opens up in a new window but it’s small enough so it doesn’t entirely block the checkout page underneath. 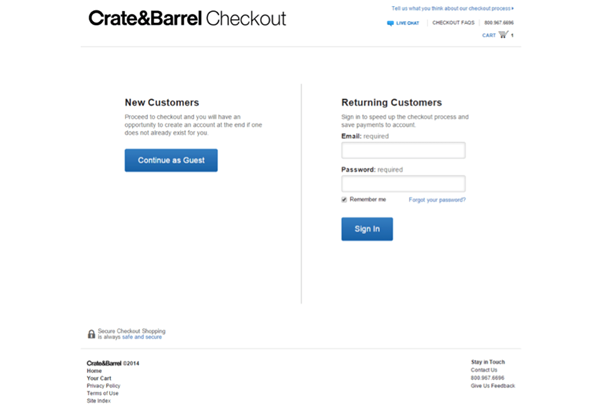 Another good example is Crate & Barrel’s checkout page, which has a live chat option in bold and highlighted in blue, along with a speech bubble next to the text link so the customer can find it easily. Also, make sure there’s always a staff member available for live chat. Having unanswered questions could lead to customers abandoning their carts. Don’t forget to include links to Frequently Asked Questions (FAQs) and to your company’s return policy on the checkout page. This way, customers can find the information they need if they are unsure about something before they complete their purchase. To ensure that a customer doesn’t abandon the checkout page, have the links open as pop-ups or new tabs instead of in the same window. Nixon includes a link to the company’s return policy on its checkout page under the customer support section, which makes it easy for customers to find. Including this information can help instil trust with the customers. 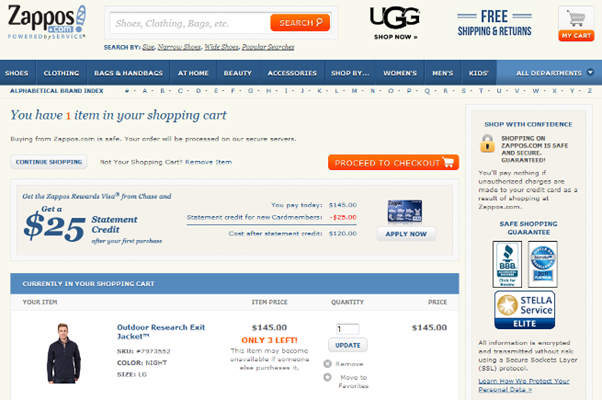 To make your checkout buttons stand out, use colors that contrast the background and increase their size. 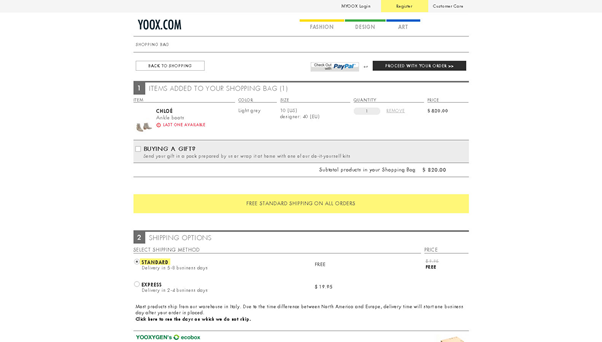 Also, add them to the top and bottom of the checkout page, as ModCloth does below, so your customers don’t have to spend too much time looking for them. 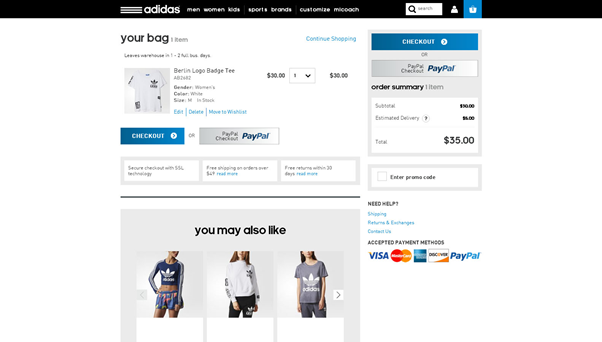 “Checkout” is the most commonly used checkout button text, but you can make it clearer and more interesting by using something like “Proceed to checkout”, “Continue to checkout”, “Proceed to purchase”, “Proceed with your order”, “Go to checkout”, “Check out now”, “Begin checkout” or “I’m ready to check out”. Try to avoid button text that simply says “Go”, “Proceed”, “Apply” or “Back”. They’re too ambiguous, which could make a customer confused and unable to complete the purchase. For example, “Apply” could be misinterpreted as the form submission button instead of a button for choosing a shipping method. A solution is to turn the button into a text link so the customer won’t see it as an action that will move them to the next step in the process. If your checkout process has multiple pages, add clear CTA’s at the bottom of each page, such as “Continue to shipping info”, “Continue to payment method” and “Continue to confirmation page”. The Honest Company does this on their checkout page, with a CTA of “Save & Continue” in order to save the info on the current page and then continue to the next page. More than 68% of shopping carts are abandoned during the middle of the checkout process, mostly because of distractions. You can remove distractions by limiting the checkout process to just one page, and by not including links on the page that take the customer out of the checkout. This ensures that customers are focused on the task at hand, allowing them to complete the purchase. 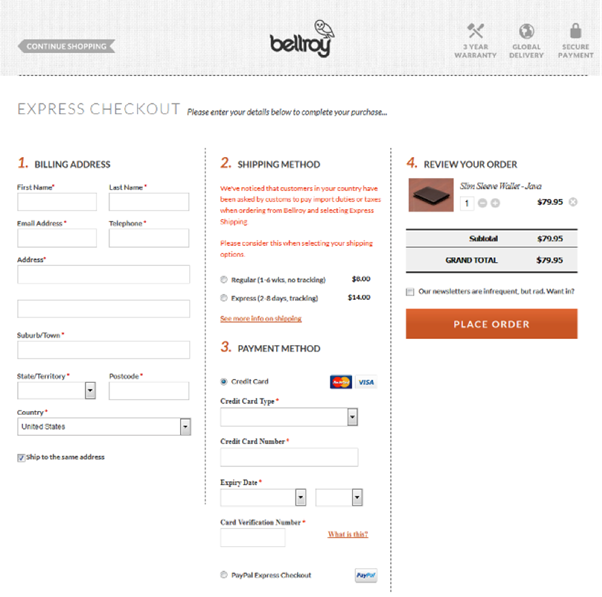 Bellroy does a great job of creating a one-page checkout that makes the process as smooth as possible for its customers. Rather than separating the sections into multiple pages, they created vertical columns to allow all the information to fit onto one page. Give your customers different options to pay for their purchase, such as via credit card, PayPal, gift voucher/card, reward points, promo codes, etc. The two most popular payment options amongst consumers are PayPal and credit card, so make sure to offer these. Having at least 1-2 payment options can help with conversions. Surfdome, for example, accepts the following payment methods: VISA, MasterCard, American Express and PayPal. With gift vouchers, gift cards, reward points and promotional codes, include fields where the customer can enter the relevant numbers to reduce the total cost they have to pay with their own money. If you sell high-end items, you may like to offer customers a payment plan. Security seals, or trustmarks, increase the trust and credibility of a store in 50% of customers. When people see security seals during checkout, they’re more likely to trust your company and know that their credit card details and other personal information will remain safe, and that the transaction is secure. Here are some examples of trustmarks you can use to give your customers a sense of trust when paying online. Norton and McAfee are the top two most trusted security seals. Other popular security seals include VeriSign and TRUSTe. You could also add an SSL logo to your checkout page, which usually has an icon of a padlock. 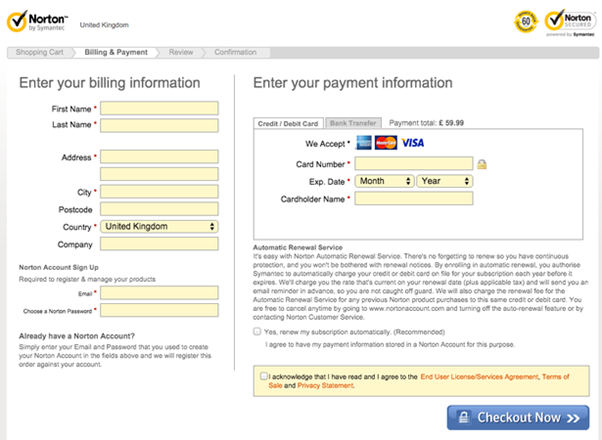 Symantec has the Norton Secured security seal on its checkout page, plus a padlock on the checkout button. Security seals can also be used as payable options. You can do this by placing a padlock and/or security text on the checkout button that says “Proceed to secure checkout”, “Pay securely now” or “Place my 100% secure order now”. Offering a complementary product or two before a customer pays for their purchase can help you make a larger sale. In fact, over 50% of people are more likely to return to a site that offers product recommendations because they want to be certain that they’ve got everything they need to get the most out of their main purchase. For electronic products, recommending an adaptor for an item that doesn’t originally come with one is a good move, as an example. To increase the chance of a customer accepting the complementary product, its price should be less than 50% of the cost of the main product. Also, the total cost must not exceed the amount of money the customer was planning to spend. This will make the customer feel comfortable spending more money for the purpose of improving their experience with the main product. On the other hand, you can up-sell with digital gift cards. For example, you can let customers add a gift card to their shopping cart or get 10% off their order when they add a gift card. When cross-selling or up-selling, you should offer products in a way that both grabs the customer’s attention and they don’t forget about their existing shopping cart. Crate & Barrel does this really well by including cross-sell items inside the shopping cart itself. 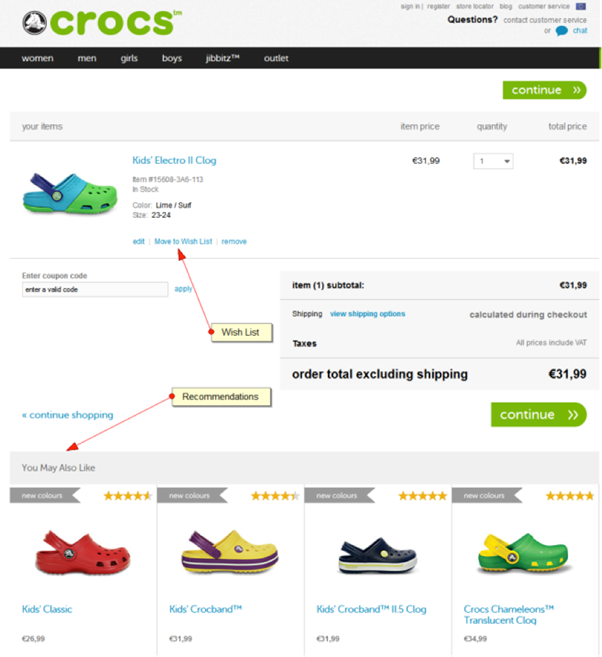 Crocs encourages consumers to buy more items by recommending related products on the first checkout page. 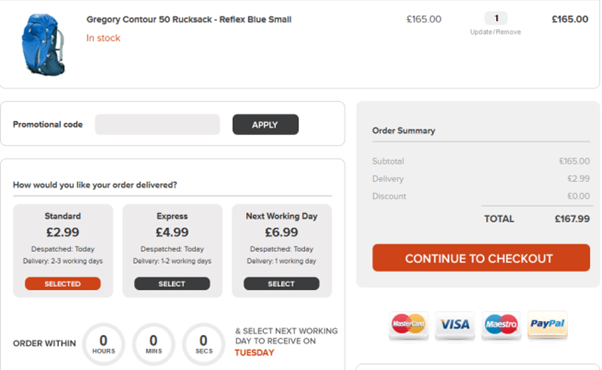 By optimising your checkout process, you can decrease cart abandonment and increase conversion rates. With clearly visible and understandable product and cart information, as well as a smooth user experience and conversion process, customers can make a confident purchase decision. What’s more, they’ll most likely buy from you again, boosting your sales further. 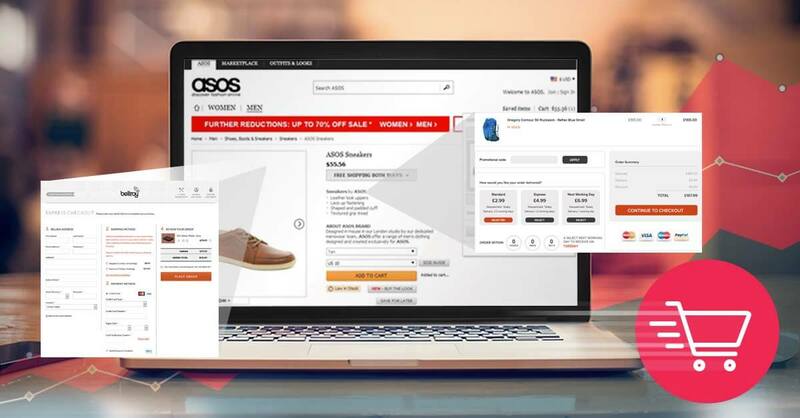 Don’t forget to test each checkout page tactic to find out which ones are most effective for your business, and will get you the highest conversions. Or if you need some help improving your checkout process, contact us at Web Profits.